Columbia researchers presented their work at the Empirical Methods in Natural Language Processing (EMNLP) in Brussels, Belgium. Professor Julia Hirschberg gave a keynote talk on the work done by the Spoken Language Processing Group on how to automatically detect deception in spoken language – how to identify cues in trusted speech vs. mistrusted speech and how these features differ by speaker and by listener. Slides from the talk can be viewed here. Five teams with computer science undergrad and PhD students from the Natural Language Processing Group (NLP) also attended the conference to showcase their work on text summarization, analysis of social media, and fact checking. This paper presents the ColumbiaNLP submission for the FEVER Workshop Shared Task. Their system is an end-to-end pipeline that extracts factual evidence from Wikipedia and infers a decision about the truthfulness of the claim based on the extracted evidence. Fact checking is a type of investigative journalism where experts examine the claims published by others for their veracity. The claims can range from statements made by public figures to stories reported by other publishers. The end goal of a fact checking system is to provide a verdict on whether the claim is true, false, or mixed. Several organizations such as FactCheck.org and PolitiFact are devoted to such activities. The FEVER Shared task aims to evaluate the ability of a system to verify information using evidence from Wikipedia. 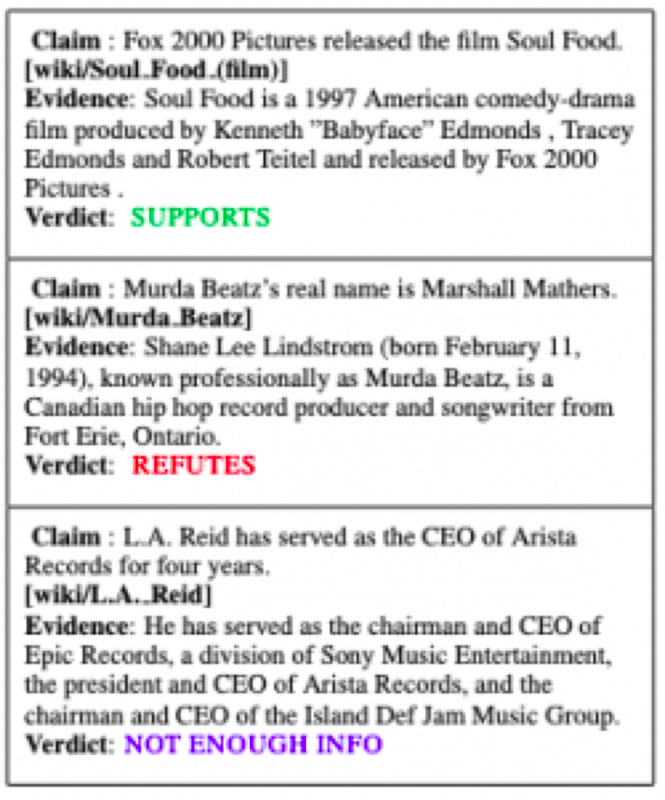 Given a claim involving one or more entities (mapping to Wikipedia pages), the system must extract textual evidence (sets of sentences from Wikipedia pages) that supports or refutes the claim and then using this evidence, it must label the claim as Supported, Refuted or NotEnoughInfo. This research is a collaboration between Professor Kathy McKeown’s NLP lab and the Columbia School of Social Work. Professor Desmond Patton, from the School of Social Work and a member of the Data Science Institute, discovered that gang-involved youth in cities such as Chicago increasingly turn to social media to grieve the loss of loved ones, which may escalate into aggression toward rival gangs and plans for violence. The team created a machine learning system that can automatically detect aggression and loss in the social media posts of gang-involved youth. They developed an approach with the hope to eventually use a system that can save critical time, scale reach, and intervene before more young lives are lost. The system features the use of word embeddings and lexicons, automatically derived from a large domain-specific corpus which the team constructed. They also created context features that capture user’s recent posts, both in semantic and emotional content, and their interactions with other users in the dataset. Incorporating domain-specific resources and context feature in a Convolutional Neural Network (CNN) that leads to a significant improvement over the prior state-of-the-art. 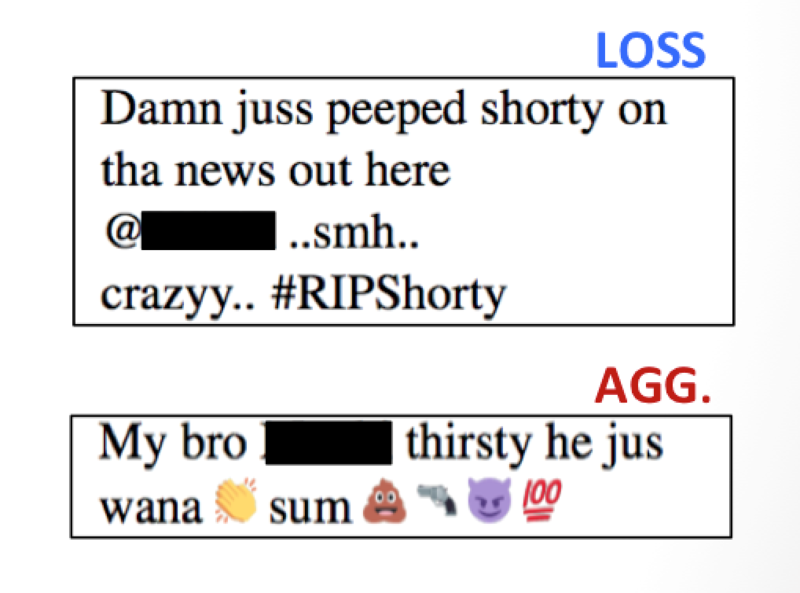 The dataset used spans the public Twitter posts of nearly 300 users from a gang-involved community in Chicago. Youth volunteers and violence prevention organizations helped identify users and annotate the dataset for aggression and loss. Here are two examples of labeled tweets, both of which the system was able to classify correctly. Names are blocked out to preserve the privacy of users. For semantics, which were represented by word embeddings, the researchers found that it was optimal to include 90 days of recent tweet history. While for emotion, where an emotion lexicon was employed, only two days of recent tweets were needed. This matched insight from prior social work research, which found that loss is significantly likely to precede aggression in a two-day window. They also found that emotions fluctuate more quickly than semantics so the tighter context window would be able to capture more fine-grained fluctuation. Automated fact checking of textual claims is of increasing interest in today’s world. Previous research has investigated fact checking in political statements, news articles, and community forums. As part of the FEVER community shared task, the researchers developed models that given a statement would jointly find a Wikipedia article and a sentence related to the statement, and then predict whether the statement is supported by that sentence. 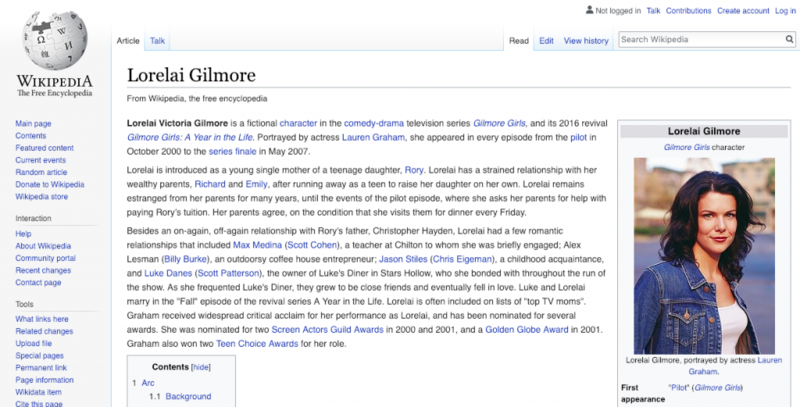 For example, given the claim “Lorelai Gilmore’s father is named Robert,” one could find the Wikipedia article on Lorelai Gilmore and extract the third sentence “Lorelai has a strained relationship with her wealthy parents, Richard and Emily, after running away as a teen to raise her daughter on her own” to show that the claim is false. One aspect of this problem that the team observed was how poorly TF-IDF, a standard technique in information retrieval and natural language processing, performed at retrieving Wikipedia articles and sentences. Their custom model improved performance by 35 points in terms of recall over a TF-IDF baseline, achieving 90% recall for 5 articles. Overall, the model retrieved the correct sentence and predicted the veracity of the claim 50% of the time. The rate of which misinformation is spreading on the web is faster than the rate of manual fact-checking conducted by organizations like Politifact.com and Factchecking.org. For this paper the researchers wanted to explore how to automate parts or all of the fact-checking process. A poster with their findings was presented as part of the FEVER workshop. “In order to come up with reliable fact-checking systems we need to understand the current manual process and identify opportunities for automation,” said Tariq Alhindi, lead author on the paper. They looked at the LIAR dataset – around 10,000 claims classified by Politifact.com to one of six degrees of truth – pants-on-fire, false, mostly-false, half-true, mostly-true, true. 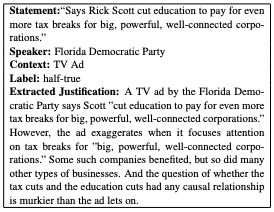 Continued Alhindi, we also looked at the fact-checking article for each claim and automatically extracted justification sentences of a given verdict and used them in our models, after removing all sentences that contain the verdict (e.g. true or false). Feature-based machine learning models and neural networks were used to develop models that can predict whether a given statement is true or false. Results showed that using some sort of justification or evidence always improves the results of fake-news detection models. Their research extends the previous work done on this data set which only looked at the linguistic cues of the claim and/or the metadata of the speaker (history, venue, party-affiliation, etc.). The researchers also released the extended dataset to the community to allow further work on this dataset with the extracted justifications. Recently, a specific type of machine learning, called deep learning, has made strides in reaching human level performance on hard to articulate problems, that is, things people do subconsciously like recognizing faces or understanding speech. And so, natural language processing researchers have turned to these models for the task of identifying the most important phrases and sentences in text documents, and have trained them to imitate the decisions a human editor might make when selecting content for a summary. While these deep learning models are empirically successful, it is not clear how they are performing this task. By design, they are learning to create their own representation of words and sentences, and then using them to predict whether a sentence is important – if it should go into a summary of the document. But just what kinds of information are they using to create these representations? One hypotheses the researchers had was that certain types of words were more informative than others. For example, in a news article, nouns and verbs might be more important than adjectives and adverbs for identifying the most important information since such articles are typically written in a relatively objective manner. To see if this was so, they trained models to predict sentence importance on redacted datasets, where either nouns, verbs, adjectives, adverbs, or function words were removed and compared them to models trained on the original data. What surprised the researchers were the news articles – removing any one class of words did not dramatically decrease model performance. Either important content was broadly distributed across all kinds of words or there was some other signal that the model was using. They suspected that sentence order was important because journalists are typically instructed to write according to the inverted pyramid style with the most important information at the top of the article. It was possible that the models were implicitly learning this and simply selecting sentences from the article lead. Two pieces of evidence confirmed this. First, looking at a histogram of sentence positions selected as important, the models overwhelmingly preferred the lead of the article. Second, in a follow up experiment, the sentence ordered was shuffled to remove sentence position as a viable signal from which to learn. On news articles, model performance dropped significantly, leading to the conclusion that sentence position was most responsible for model performance on news documents. However, Kedzie sees this as an opportunity to improve the utility of word representations so that models are better able to use the article content itself. Along these lines, in the future, he hopes to show that by quantifying the surprisal or novelty of a particular word or phrase, models are able to make better sentence importance predictions. Just as people might remember the most surprising and unexpected parts of a good story.